The nexus refers to the association of interactions that link water, energy and food resources in a common system. 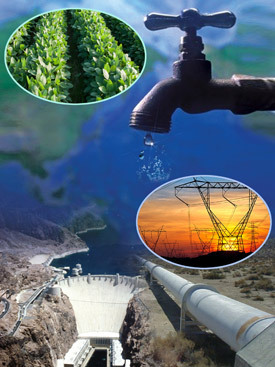 Water, energy, and food serve as the foundational ingredients for modern civilization. With an increasing population comes an increasing demand for each of these resources. These three resources and their use are inextricably linked to each other, to the environment and to every individual. Water, energy, and food are the top 3 drivers of economic and social, as well as national sustainability risks in the U.S. and globally. They provide economic sustainability and thus, foster countries, cultures, science solutions, and policy that form the foundation of societal changes, sustainability, and resiliency and are interdependent in that foundation to every USGS mission area. New water, energy and food solutions must be integrated with innovative, sustainable technologies that boost one resource without draining the other. At the same time, these technological solutions inevitably have a sustainable impact on the environment (and society in general), and the environment will have a significant impact on their achievability and success. Collectively, WEF and their demand, use, and interconnectedness with the economy, national sustainability, and standard of living in the United States will play a strategic role in our future. As demand for WEF resources grows due to human activities, new pressures on environmental health, water supply, ecosystem functioning and related USGS missions also will grow. 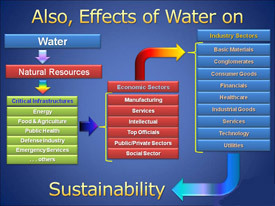 The importance of WEF will increase as supply of these resources decrease, which is likely since water resources, although renewable, are not expandable. This result will directly affect both energy and food with consequent results to environmental and human health and our missions. Further, other natural earth processes such as hazards, climate trends, and their effect on infrastructure will have a proportional effect on WEF supply, distribution, growth processes and systems. As an example, hazards directly affect power, which directly influences food production and water distribution, as well as public health and the environment and other areas. Move forward with addressing these risks. Tindall, J.A., and E.H. Moran, Virtual water: Mass balance implications (forthcoming).